Today’s AM fix was U.S.D 1,690.00, EUR 1,265.82, and 1,060.49 GBP per ounce. Yesterday’s AM fix was U.S.D 1,683.25, EUR 1,260.11 and GBP 1,050.85 per ounce. Silver is trading at $31.79/oz, €23.91/oz and £20.04/oz. Platinum is trading at $1,695.25/oz, palladium at $723.00/oz and rhodium at $1,150/oz. Gold rose $7.00 or 0.42% in New York yesterday and closed at $1,686.90/oz. Silver fell to a low of $31.038 in early New York trade, but then it surged to a high of $31.891 at about 1800 GMT and finished with a gain of 0.7%. 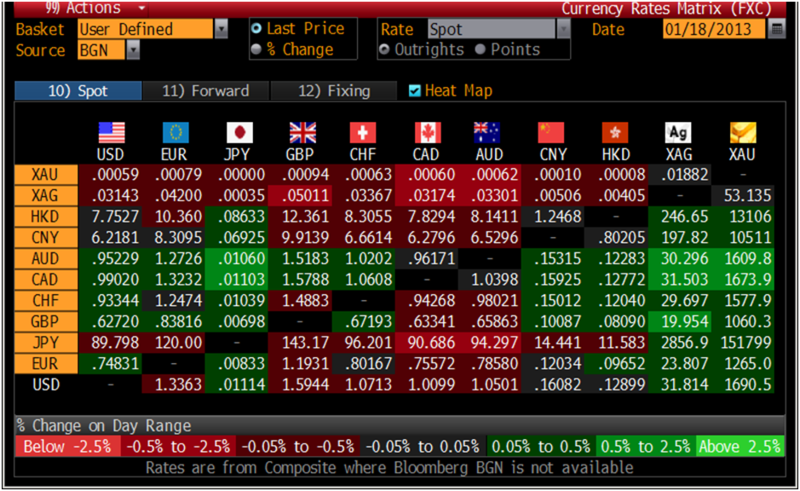 Gold is higher in all currencies this week. It is up 1.7% in dollar terms, 1.5% in euro terms, 2.4% in yen terms and 2.8% in pound terms. Some investors see the recent sell off as overdone and are buying gold on the dip in anticipation of further gains in 2013. While gold looks poor from a technical point of view, after a series of weekly losses, its fundamentals of robust investment and central bank demand remain intact. The almost certain higher weekly close today may embolden bulls who are expected to come back into the market. Gold will be supported by the U. S. political standoff about the debt ceiling and expectations of continual quantitative easing.